Analogue Film Club 1 was a Conjunction event from The Fish Factory, Penryn and CMR Project Space, Redruth organised by Stuart Robinson, Alice Mahoney, and Rose Hatcher. This session aimed to bring together artists and creatives with an interest in analogue photography processes and techniques, including alternative darkroom processes, film photography, pinhole photography and experimental practices. 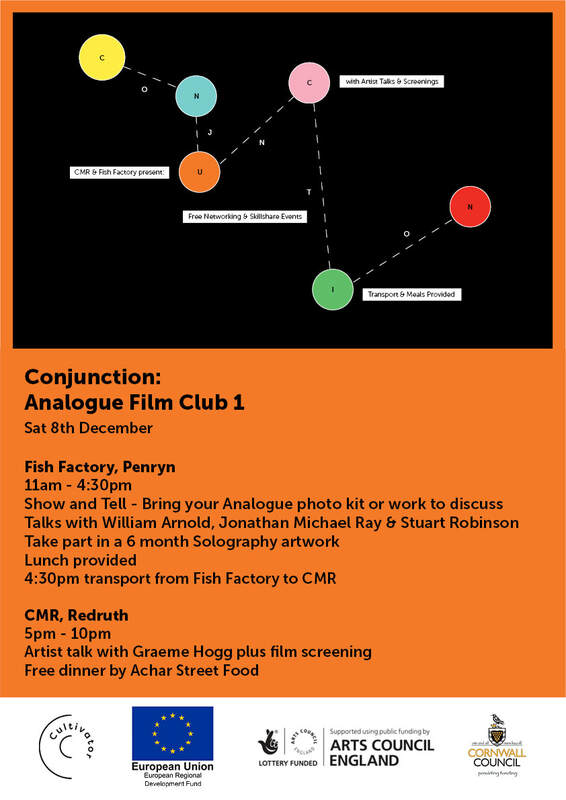 The day begin at 11am at The Fish Factory with introductions and a tour of the new darkroom and studio facilities. This was followed by a ‘Show and Tell’ where guests were invited to bring in their examples of analogue photography equipment, obscure film formats and analogue photographic works to discuss with the group and share their experiences. There was an opportunity to explore the process of loading and developing film and introduce perticipants to the Fish Factory darkroom. There was a break for a free networking lunch with further opportunity to discuss processes and techniques. After lunch there were talks by local photographic Artists, William Arnold (www.williamarnold.net) and Jonathan Michael Ray (www.jonathanmichaelray.com) where they discussed their creative practice and how and why they use analogue processes in their work with examples and discussion. This was followed after a break by a talk from Fish Factory studio resident Stuart Robinson (www.stuartrobinson.net) on his experiences using analogue photo processes in his artistic and teaching practice with a focus on Pinhole Cameras and Solography. Participants were given a pinhole ‘can camera’ with instructions on how to set it up at home in order to be part of a 6 month long exposure Solography project. At 5pm the evening continued with a talk by Graeme Hogg, followed by dinner with Achar Street Food and ending with some screenings. Graeme Hogg is an Artist best known for his founding involvement with the Cube Cinema in Bristol which is now twenty years old. Since the apparent 'Death Of Cinema' which happened in May 2001 he has been collecting its relics, artefacts and general machinery with a view to challenging the intellectual orthodoxy of this terminal narrative. His current project 'Nachleben Experimental Film Lab and Archive' is just that, a film lab, archive and production environment under experimental artistic control. For his appearance at CMR he presented an 'Experimental Lecture' that looked at some of the issues facing his new project, its works so far, its aims and objectives and the works at the centre of his research into 'analogue artefacts in digital networks' that form the practical basis of his MRes degree. The purpose of Conjunction is to create an active network of artists and designers who are interested in sharing technology, skills and knowledge whilst offering the combined resources, facilities and equipment of The Fish Factory and CMR as a starting point and meeting place.